preferito Amore Interest for Xena? Do te think Xena was a good mother? What do te think was the biggest change in Gabrielle's life? Can anyone help me track down which te tube commentary o interview includes Lucy Lawless saying something along the lines of 'Xena is someone who sees Gabrielle, really sees her for who she is'? Want to cite it in a dissertation! do te think Xena is stupid? why xena and hope are leisabins and baciare each other? Hi guys, I was a fan of this mostra and I'll tell why Xena is my favourite mostra when it was broadcast in Malaysia many years ago. Unlike many fantasy TV series, the story-line is very unusual and it is no wonder that the series gained popularity for its brilliant writing. It was a spin-off from the Hercules series, from which I didn't know at that time. Really i can't fantasize Gabrielle living and fighting without Xena. What did she became after Xena's death? Maybe she became a great warrior trying to keep alive the memory of The Warrior Princess. Like Xena did when Lao Ma died ( she tried to keep alive her memory and she was folowing her way). The first time i saw Livia, i detto ''proud and strong warrior just like her mother''...! Livia was really perfect warrior, but without feelings, just like her other mother, Callisto!! She took away lifes, she was destroying villages, she had her own bad army, just like Callisto!!!!! Eve was a goodhurted girl, with feelings and she choose to follow the path of love, the path of her other mother Xena. Without unjusts killings and without malice to others, just like Xena!!!!! I tried to remember how was Ares when he met Xena and how he was in 6 season. Ares was changed da Xena! His Amore for her became the reason why the God Of War became the God Of Love...And i am sure that Xena had powerfull feelings for him because she had the ability and the opportunity to kill him but she didn't. Ares gave him immortality to save Gabrielle's and Eve's life. But he didn't do this to save them, but not to hurt Xena. The old Ares never could do this. 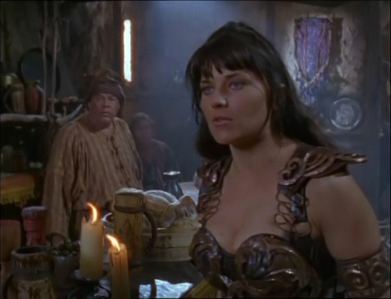 So the Amore is so powerfull to change Xena and after to change Ares! Wanna A Story For Xena? Not to sound not fair, But If the Cast/Crew Will agree to do Scenes with us. it Would be nice,Would it? It was all understandable. The decision was made not to bastardize the truthful nature of the best-selling book based on the Oakland A's accomplishing so much on a flimsy budget. The problem was simple: The truth wasn't good enough. And that's unfortunately what turns this film into a double, instead of a home run. As everyone involved freely admits, there's just no natural Hollywood ending. One giorno is a drippy, uninvolving movie adaptation of a best-selling novel once described da an Entertainment Weekly book critic as ''a nuanced Amore story disguised as a spiaggia read'' and ''a surprisingly deep romance'' that opens with a ''Hollywood-ready setup.'' That book critic now wants to ask this movie critic what went wrong. Conveniently, both critics are me. An interview with 'Xena' writer and producer Steven L. Sears at an Infolist party in Beverly Hills. What price did the innkeeper charge?